Behold! Our Third anniversary block party is upon us. Make plans come celebrate 3 years of making El Paso's craft beer with us. We will have 28 DeadBeach taps with a great lineup of rare DB beers. We will have two bottle releases throughout the day, Our Third anniversary beer, a pastry stout (Stripper $) aged in Woodford Reserve barrels and E and J brandy barrels for over a year, and our Double Stufd' bottle release, an oreo cookie imperial milkstout. Both releases will have allotments. We have a great lineup of music and entertainment. 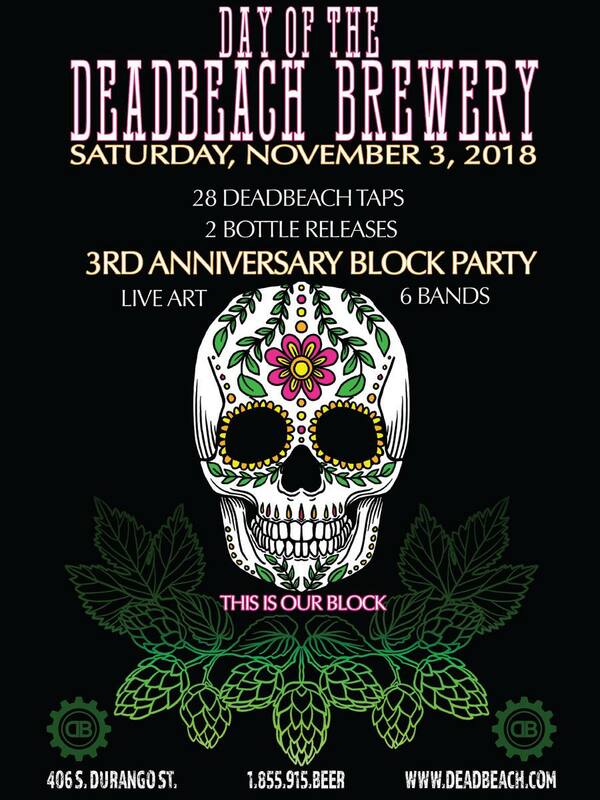 This is a FREE EVENT, bring your kids, bring your mom and dad, mark your calendars and prepare for the Day of the DeadBeach, third anniversary block party.